I enjoyed the film a lot (it helped that I watched it in PVR's über-luxurious Gold Class, with its Lazy Boy chairs that can recline to 180 degrees – but more on that some other time). Thought it was very efficiently directed and edited, with some sharp characterisations and solidly executed action scenes. (Take a bow, Rob Miller.) I'm sure there are flaws but I'll have to go and see it a second time, critical faculties switched on, to make a list of them. There's a certain type of film that's easy to dissect once you've stepped out of the theatre and lost sight of how completely it held you while you were actually watching it. I think Chak De India is one of those films; though it's been almost universally liked in its first run, I wouldn’t be surprised if it suffers an eventual decline in reputation. - It's interesting that a film which stresses the group dynamic is bookended by a story about the fall from grace and eventual redemption of an individual who has been shunned by an often-insensitive, unthinking society. That this individual is played by the country’s most popular actor (even though Shah Rukh’s superstar persona is never allowed to overwhelm the film) gives the viewer an immediate stake in his redemption. - Yes, there are generalisations and some stereotyping, as Baradwaj points out in his review, but nothing that seriously affects the film's credibility. For instance, the depiction of the girl from Punjab as a robust, short-fused but golden-hearted type who proves invaluable in a match against an aggressive team (Argentina): this IS a bit lazy and amounts to indulging the audience's expectations, but you can’t exactly call it inauthentic. (Question: Is it credible that a member of the Punjabi women's hockey team might look and sound like Balbir Kaur? Answer: Yes.) It could just as easily be argued that the scene in which two roadside Romeos check out the Manipuri girls is a cliché/generalisation, as are the early scenes showing the irresponsible, knee-jerk reactions of the sports fan on the street, but these are also truths about the society we live in, and they add to the film’s effect. Anyway, it’s equally important to acknowledge the clichés that Chak De manages to sidestep. How easy it would have been, for instance, to slightly expand the role of the team's chaperone (the stout, dark-complexioned lady who watches quietly from the sidelines during practice and with whom Kabir Khan shares dinner and conversation), have her played by a popular young actress and turn her into a love interest (or a therapist/confidante) for Kabir. Thankfully, the screen time that could have been thus wasted is given instead to the talented cast of unknown youngsters. The scene where she makes a sexual proposition to Kabir Khan was quite telling. Treated differently, this could have been a standard, vixen-out-to-get-what-she-wants moment, but you get the impression here that Bindiya has been through this grind before, that she's had to make similar compromises in the past and has come to see it as part of a go-getting Indian sportswoman's life. In this context, it’s very effective that the film refuses to give her a back-story or to provide an emotional scene where her attitude is "explained". Early on, when she tries to turn the other girls against Kabir by spreading gossip about his past disgrace, you get a sense of someone who's simultaneously part of a corrupt system and an outsider who's been deeply wounded by it. Bindiya is a genuinely complex character by the standards of mainstream Hindi cinema. - Very little sugar-coating at the end. Sure, we have drumrolls and the improbable triumph, but there’s no pretence that something has changed permanently for the better, that the protagonists' lives henceforth will be wine and roses. In his pep talk to the team just before the final, Kabir tells them that whatever else might happen in the rest of their lives, no one can take the next 70 minutes away from them. It's a statement laced with pragmatism and an understanding of the hard realities of these girls' lives. Despite Chak De's cheerful ending and the upbeat clips that play while the titles roll, it's possible to see that for most if not all of these girls, those 70 minutes probably will remain the high point of their lives by a long way; that nothing else that follows will be anywhere near as good. Has the Indian sports film grown up and smelled the coffee? "Has the Indian sports film grown up and smelled the coffee?" This Indian sports film merely smelled Kurt Russell's Miracle. Superb notes, Jabberwock. A pleasure to read. I too loved the way Bindiya Naik's role was conceived. Brilliant. (I felt it had some interesting parallels within the movie universe, her role was like one of those world-weary, expert-but-corrupt cops whose accomplicity is key to the just-arrived protagonist.) And, Shilpa Shukla played it brilliantly. In fact, the many close-ups of her face throughout the film says how much she stood apart. Those were really insightful observations. The core of the movies is cliched and the characters sterotypical.But there is a natural feel to all of it and the ability to stick to the main plot(the girls) is commendable(mercifully there is no attempt to extract any mileage from SRKs star status). The Hollywood equivalent of a "Chak De' would probbaly have been passed off as a B grade product(so may of these stories have been done there). But out here this ones an original.This is really intelligent mainstream cinema. It was good to see SRK ACTING again. There was a phase when we got fed so much mannerisms! Anon: I agree. The film made exactly as it was would have been fairly run-of-the-mill in Hollywood. The superior filming of the action scenes wouldn't have made too much of an impression either. Neha: I don't get the Gonzalez analogy. If we're comparing this to his Australian Open run, Chak De would have had to end with the Indian girls making it to the final and then getting roundly thrashed there, by the best in the business (the Australian team in this case). The improbableness of the Chak De triumph comes from their being such serious underdogs - the lack of infrastructure or a serious sporting culture back home, regional divides, the sexist discrimination, the fact that they almost didn't make it to the WC in the first place. To be honest, all these factors make it next to impossible that a real-life Indian women's hockey team will win a world cup anytime in the near future. In that sense, of course, the film is completely unrealistic: it's based on the rose-tinted notion that a team can win a world cup simply by virtue of being Very Determined (or being United Indians). Even with Gonzalez's unexpected surge at the AO, the fact is he was ranked in the top 15 at the time - so it wasn't such a huge shock. Also, how does Federer fit into this? He's clearly the most talented tennis player in the world, and he comes from a country where the game is taken seriously at a competitive level. No underdog status there. Krishna: I don't see the problem with that. From a purely logical point of view it makes sense, because that's how commentators usually talk (this is true of other countries too - English cricketers, for example, being introduced in terms of the counties they play for). It's the coach's job to instil the "play for your country, not your state" discipline in his players, but that doesn't mean that everyone else will lose sight of the fact that these girls are from different parts of the country. As you know, when a hockey team comes home after winning a tournament, the leading goal-scorer becomes a source of pride for his state. That's just the way things are. Oh Federer comes into the picture by being such an impossibly talented, successful and good sort of bloke. anybody made a movie on a person like that and I would have called it unrealistic. Or maybe, this is just a fan gushing. Yeah I realised Gonzalez's wasnt the best example as soon as I finished typing it; but I had an unusually short lunch at work today - this one also has a 9 to 5 job. But surely we have had some underdog win, would call it highly highly unusual. Alright that is what is unrealistic, not impossible? Peace. I usually like reading reviews after watching the movie, glad you wrote about it. Jai:A very nice analysis of the film .However I think that the very thing of playing for the country or the team is alien in India. This is something which the film rightly depicts. The Australian cricket team is very proud of their colours, Steve Waugh kept wearing his battered first Baggy green cap till he retired. The Pakistan team under Imran Khan was also known for its ferocious nationalistic attitude. I agree that we often tend to get jingoistic when depicting patriotism , however team sports are all about teamwork and this is what helps teams win in the tightest of situations.There is no doubt that at the grassroots level we are still a 'state dominated country'. More than Miracle, i think this movie is more reminiscent of Remember the Titans - the Denzel Washington which is also based on a true story set in early 1970's. An integrated school takes of all white schools in the local American football league. It is coached by Denzel Washington. The proof of the validity of the stereotypes in Chak de lies in their unquestioning acceptance by the public. While there are highly motivated groups who get offended by a tale about devdasis (Water) to the point where they are willing to violently disrupt the shooting, there seem to be no groups who are willing to similarly protest the brutal portrayal of Kabir Khan's disgrace. That he has managed to expose this reality is Shimit Amin's greatest achievement. very very OT, but will you be writing a post on SCS anytime ? Which year did you pass out ? chak de india... wat a movie..!! after a long time we get the oppotunity to see such a wonderful movie.. every single scene was potrayed such wonderfully..
it was like watching a real world cup..the people (including us) in teh hall were shouting , as if were trying to cheer the team india in the world cup matches..
as teh janaganamana theme started to play all the viewers in the hall stood up..that was a wonderful feeling..
throughout the movie i kept on saying my god this bindiya maik is playing such politics..i was furious seeing her..but wen she came to the feild for the semifinals and made the team win, automatically bindiya naik became the favourite of all..
teh funniest thing was i ended up in saying that this "BINDIYA NAIK" is so damn good...she is just superb. her attitudes, her negative frame of mind, her acting made me her fan... she is great............!! Great 'Note'. Regarding the improbableness of chak de's triumph, didn't it actually happen in 2002 when India won a gold in commonwealth games ? The players are upbeat about their performance, and are aware about the effect that the film has generated. Veteran Dileep Turkey says, “Chak de! India has supported hockey. It has spread awareness amongst the masses that it is an interesting game. Songs from the movie were played before the start of the match to motivate the team members. But all the credit goes to the coach and the players for the hard work. Avid reader of your blog and really like it. 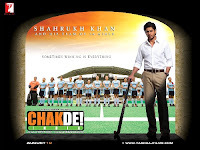 I happened to watch Chak de on DVD a few days ago and quite liked it. But I dont think it deserves the accolades it has received. While it may have sidestepped a few cliches - we still have your stereotypical sports movie scenario - burnt out an failed coach nurses back team of losers to teach them a valuable lesson in team spirit thereby ensuring they succeed. But I may be asking for too much out of a sports movie. My big question though is would this movie have made so much of splach if SRK wasn't in it - maybe lets say a Jimmi Shergill or Irrfan Khan? The insidious problem is that our movie industry has evolved a great deal for 70's. Hell, its evolved a great deal from 1989 with Aashiqui coming across as the pinnacle of cinematic achievement and supposed "Kitchensink" realism. The reason is that our directors now are exposed to a variety of global influences as is the audience. But in what could be our country's most recognisable product aren't we just a little too happy with minor advancements. SRK doesn't play SRK in a film and he's called a great actor. Atleast he's honest. He seems mostly about the paycheck and the fame. There are others who mystified by artistic conceits seem to believe any lemon without a few songs and in certain cases greasepaint could be high brow art (I refer to so called thespians who collect rolls royce cars for staring gloomily at the camera with sanskrit shlokas blaring in the score pretending to be all about eastern mysticism - and I am a fan - i cried in sholay and shakti). My point is we can do better and we have. We do come out with a few good movies like Hazaar Khwaishen and Johnny Gaddaar. 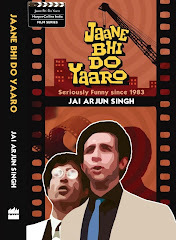 We even celebrate our own brand of cinema pretty good in certain cases - Jhoom barabar Jhoom and Bunty aur Bubli. that being said - I also believe that a review about a film is dependant on state of mind. Pauline Kael once wrote a review about a turkey - all she indicated was that she liked the film coz she cried and was moved - though it could be because she was breaking up with someone. I watched chak de trying to figure out what the deal was. I figured they got a lot right about the movie. I just wanted more. State of mind...perhaps. I did cry in Shakti. Sumit: thanks for the comment and I agree with much of what you say (except that I think the question "would this movie have made so much of a splash if SRK wasn't in it" is pointless. It probably wouldn't, but the fact is that SRK was in it and we have to deal with the film we actually have in front of us, rather than a hypothetical one). Your final comment about reviewing is of course dead-on - that's something I'm constantly aware of as a reviewer. (If I were to go and watch Chak De again today, in a different frame of mind, and perhaps knowing beforehand about all the acclaim the film has received, I'd be much more conscious of its flaws.) Just a small note: the film that Pauline Kael reviewed wasn't a turkey, it was De Sica's Shoeshine. But yes, Kael was very honest about putting herself and her feelings on the page, and making a review autobiographical.